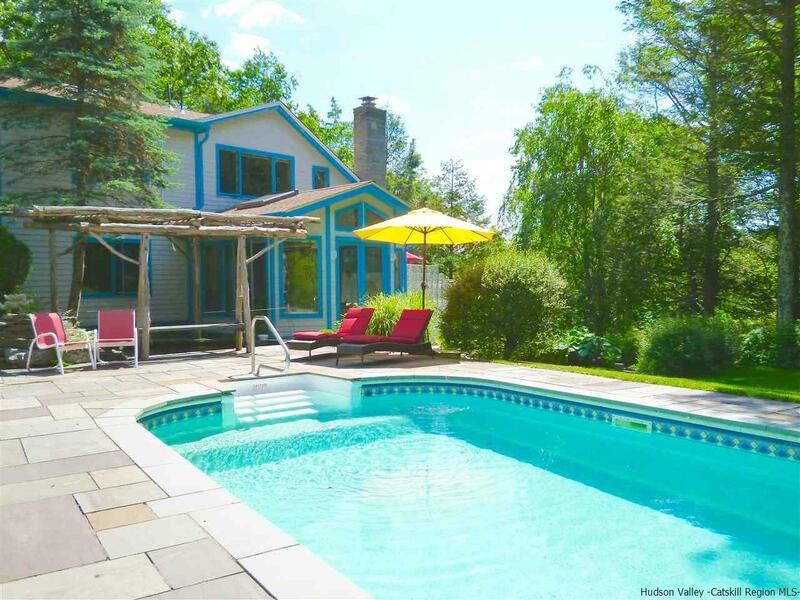 This tranquil retreat is situated only 10 minutes to Woodstock or 15 minutes to Saugerties, but you may never want to leave! Once you enter through the gates onto the fully fenced in property, take note of the gorgeous perennial gardens providing bursts of blooms, color and visual interest throughout the year. Enter the home and wander through the cook's kitchen which has all new stainless steel appliances including a Capital brand gas range and butcher block island. Then to the heart of the home-a light filled two story living room with warm wood ceiling, stucco fireplace and a wood stove as well. Windows and French doors everywhere bring the outside in and provide easy access to multiple decks and a beloved screened-in porch. The flow of this house works really well for entertaining both inside and outside - there are places to mingle everywhere - poolside, open decks, covered porches, stone patios and of course in winter the living room with toasty wood stove and fireplace for ambiance. The dining area leads to a sun room which overlooks the pool area with waterfall and koi pond offering the most soothing sound - you can't help but feel relaxed! The sellers recently completed a full bathroom renovation sparing no expense with a marriage of mission style cabinets and Moroccan tiles and fixtures. The European style radiator is also a towel warmer. A palatial master bedroom boasts unique and artistically styled wood trim and built-ins in the closet. Two additional bedrooms which are currently being used as offices plus a lower level room in the walk-out basement present many sleeping options for family and guests.In addition to the main house there is a separate building with a garage and large workshop/artist's studio, as well as a garage located across the way on the separate 4.7 acre parcel. The property consists of two deeds. The house on 1.8 acres plus the acreage across the road which is quite stunning, and surrounded by Woodstock Conservancy land and the Sloan Gorge hiking trail. Create your own hiking trails, or perhaps build a guest house or another studio across the way. There is some fencing in place for horses if desired, or just enjoy your own peaceful meadow and bask in the beautiful open space.